Polarlight 3 by Dutch Passion is obviously an improved sequel of Polarlight 1 and 2. This medical strain has been bred by crossing a carefully selected and very strong Dutch Haze with a predominately autoflowering Sativa, resulting in a strain with average yields and a THC level of around 8-12, but with a high CBD level. Resistant to mold, spider mites and other diseases. 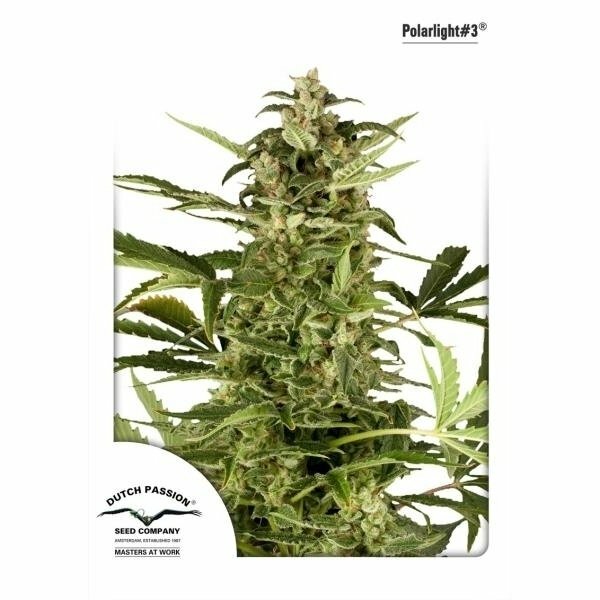 Polarlight 3, feminized, by Dutch Passion is an improved sequel of Polarlight 1 and 2 and is highly appreciated by medicinal marijuana users. A carefully selected and very strong Dutch Haze was crossed with a predominately autoflowering Sativa which resulted in a strain that yields average harvests, but makes up for it with its quality weed. The smoked marijuana induces a happy and long lasting high - some users even reported trippy effects like distorted hearing. This special high is caused by the high CBD level and 8-12% of THC. Polarlight 3 by Dutch Passion is an easy to grow strain with a high resistance to mold, spider mites and other diseases. Indoors, in a hydroponic setup, the plants reach a height of 100cm and novice growers can expect a harvest of 50g of high quality weed per plant - experienced growers can achieve up to 150g per plant. Polarlight 3 takes only 10 weeks from seed to harvest and delivers weed with a sweet and fruity citrus taste and spicy Haze flavors.